LOOKING FOR A CUSTOM LAPEL PIN? Why Not Work With A Real Pin Manufacturer? Make no mistake about it...Classic Pins are THE lapel pin professionals. Classic Pins is the nations leader in licensed sports pins and Olympic lapel pin design, custom lapel pin production, custom pin design and pin collecting distribution. 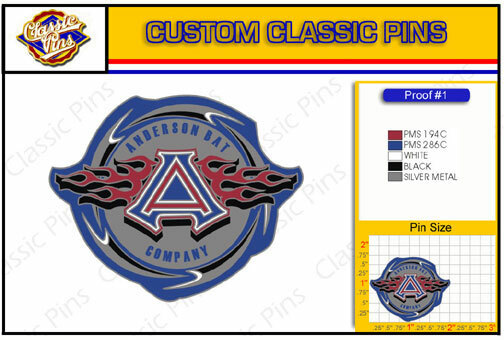 We create custom pins for small companies, schools, little league teams, private organization, Fortune 500 companies and many professional sports teams. Our design department is ready to create your custom pin. 1 - GET A QUOTE Fill out the form below with the quantity you need and any the size of the pin you would like to produce along with any other information you would like us to know and we will get you a quote with 12 hours. Minimum order is only 100 pieces. There is no need to fill out a price quote form or detailed spec sheet as we don't want to make lapel pin design more difficult then it actually is. It's actually fast and easy! 2 - HAVE ARTWORK CREATED - If you have artwork or just a custom pin concept, email what you have to customerservice@classicpins.com and we will choose the best pin process for you and have pin ready artwork within 24 hours. 3 - PRODUCE YOUR PINS - Once the artwork is approved by you, we will go to production and have your pins in your hands within 14 days. ***No payment required until your pins are in production.